Find purpose, without it you are adrift. Last week a close friend of mine told me how he’d turned around an underperforming sales team. The crucial piece was having them assess on a Friday afternoon how the week had gone and then identify what they needed to do next week. This would ensure they came in on Monday morning focused, prepared and with a sense of purpose. What he’d done was create a tight feedback loop that fed forward every single week. Re-view and Pre-view. This is the basis of life-long learning. It’s a practice anyone can develop. This simple process also helped focus their direction, giving space and time to reflect on the questions: ‘where have we been and where do we want to go?’ This is something I encourage people to do more often – take stock and check-in with yourself. Part of effective preparation is knowing how you will raise your game to make the most of the opportunities in front of you. If you want some help getting started, take a look at my recent blog post ‘Raising your Game: The two most important questions to get started’. 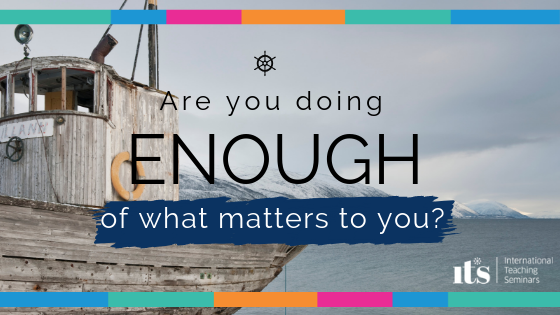 For me one of the most important questions I ask myself is; whatever I’m doing next, does it matter to me? If I can’t say ‘yes’, then I need to check why I’m doing it. Maybe it’s a necessary means to an end that most certainly does matter to me. So many people who have trained with us came to learn skills and went on to change their lives. Often they go on to change the lives of others too. Take former barrister, QC and judge, Lawrence Kershen. He took his NLP Practitioner Programme with ITS in 1989 and went on to literally change the legal system. Here’s a great example of what can happen if we choose to follow what matters to us. Even if you aren’t aware of the journey you’re on – yet! If you know that what you’re doing next matters to you then you’re definitely on the right path. Are you actively preparing to have more of this in your life? If you want to do more of what matters to you but feel stuck, have you considered our NLP Master Practitioner Programme which starts on 15th February. Or if you are new to NLP the NLP Practitioner Programme with Neuroscience starts later in the year in September. I designed these programme to give you practical skills which will raise your game and give you new choices – so why not start now.